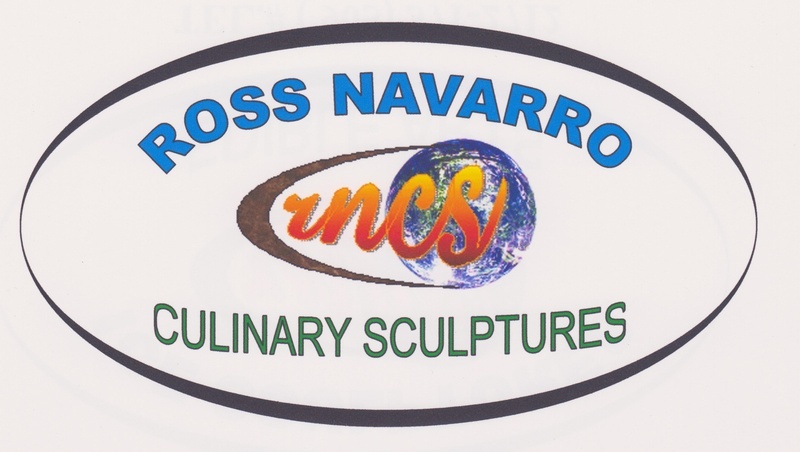 Ross Navarro Culinary Sculptures - FAQ. Q How large is a single block Ice Sculpture? A single block Ice Sculpture is carved from a single block of ice that is 40 x 20 x 10 inches. The ice block weighs 300 pounds before it is carved. Vertical a single block ice sculptures will be a maximum of 40 inches in height while horizontal ice sculptures will be a maximum of 20 inches in height and 40 inches in length. The weight of the single block Ice Sculpture can be supported by most banquet tables. Q How big are Ice Sculptures? • Small Ice Sculptures (20” by 27”- 5” thick). • Medium Ice Sculptures (20” to 35”- 5” thick). • Large Ice Sculptures (20” to 40”). Are used in most major events. They can be used either on buffet tables or focal points throughout the room. Q How long will my Ice Sculpture last? There are many variables when it comes to the longevity of an Ice Sculpture. For example, temperature, direct sunlight, size of the ice sculpture, ventilation, indoor/outdoor event, all play a very important role. On average, the life expectancy of an Ice Sculpture placed indoors will last for approximately 6-8 hrs depending on design. Of course, fine details such as the nose, eyelids etc. will be the first to melt. 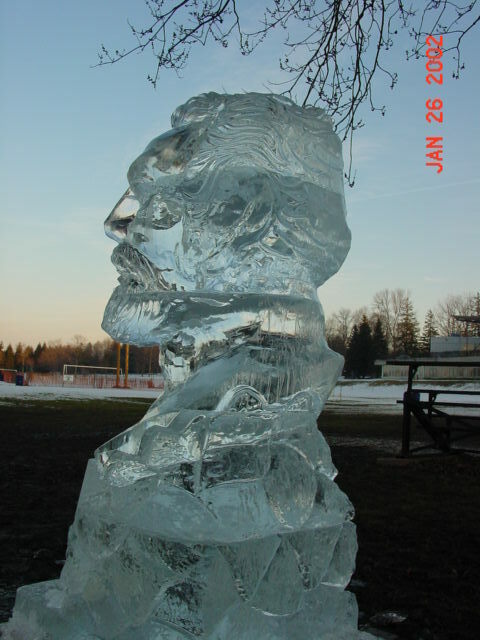 Q How can you stop an Ice Sculpture from melting? You cannot stop it or slow down the melting process. Only if it is displayed outside in cold conditions may an ice carving be preserved. The beauty of an Ice Sculpture is that something so perishable is sculpted into a work of art only to be viewed once. Q What happens to all the water when it melts? A drip pan is placed underneath a sculpture, with a hose attachment that leads to a container that his hidden underneath the table. Q Are your Ice Sculptures made out of molds? No, they are not. 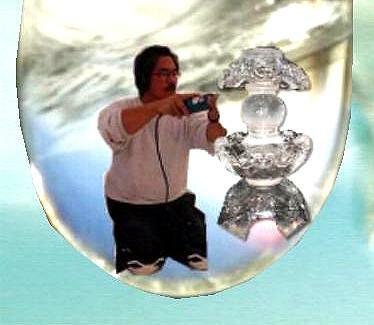 Each ice sculpture is hand carved by Ross Navarro personaly. Q Can you create an original or customized Ice Sculpture for us? Ross can work from any idea you may have. Almost anything can be carved out of ice. Q How do you make the writing, letters, or logos white? We carve the letters or logo using router bits, and die grinders, similar to a dremel tool. Then we refill the engraving with a fine ice and snow mixture. Q Why is your ice clear, while others I’ve seen, have a white centre? All of our ice is made at our carving studio in Clinebell machines. These machines are designed to create ice that is perfectly clear. Q What tools do you use to carve the ice? Electric chainsaws, die grinders, angle grinders, router bits, chisels and long term experience of sculpturing. Q How far in advance should I order my Ice Sculpture? When placing an order, we suggest that you contact Ross Navarro as soon as you begin planning your event. All orders that are placed in advance, will have a secure delivery date. We do welcome last minute orders and will try our best to fulfill the request, however, these types of orders might be subjected to a more limited selection.